Despite the dismal home construction related news in North America, Bangalore, India, is experiencing the opposite scenario with strong home and commercial building activity to meet demand. 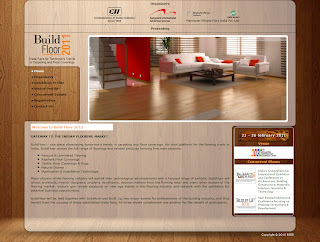 No wonder that it will be the site of Build Floor 2011, taking place February 23 through 26, 2011. Bangalore is known as the Silicon Valley of the East and is home to many major technology companies. Starting with the boom of the technology industry in the early 90s, Bangalore continues to grow in population as does its commercial and residential infrastructure. Bangalore's continued growth has led to opportunities in the construction and real estate markets so it makes sense that there would be a forum for buyers in India to source new products, meet with potential suppliers in the building and flooring industry as well as gather information on new and innovative products. What makes Build Floor 2011 particularly interesting is that it will run concurrently with BuildArch 2011 and Build Up 2011, which focus on Real Estate and Construction. The three events take place February 23-26, 2011 at the Bangalore International Exhibition Centre. This biennial event that was founded in 2008 will also attract regional engineers, retail companies, architects, designers, contractors as well as project managers and consultants in India. The event is organized by Bangalore International Exhibition Services and Hannover Milano Fairs India PVT. Ltd. It is endorsed by the Confederation of Indian Industry which is a non-profit association dedicated to the development of India. Here's a link to the Fact Sheet for the show. If you'd like more information about Build Floor 2011, I'll be happy to put you in contact with the right person.